I’m back from Maine and finished talking about what I ate there. Well, in truth there were so many good things that I still keep talking about them, just not here! It is of course time for What I Ate Wednesday hostessed by the lovely Jenn at Peas & Crayons. I’m actually wondering what’s up with her…there should be a baby on the way and I’m just wondering…. I’m forging ahead as though there will be a WIAW, because after all…there’s Always a WIAW! I’m still a bit confused since coming home from Maine. I have food photos but almost No clue what day they’re from so I’m just going to share. I was attempting to get back on track with cooking and eating but of course, life gets in the way and that doesn’t always happen. 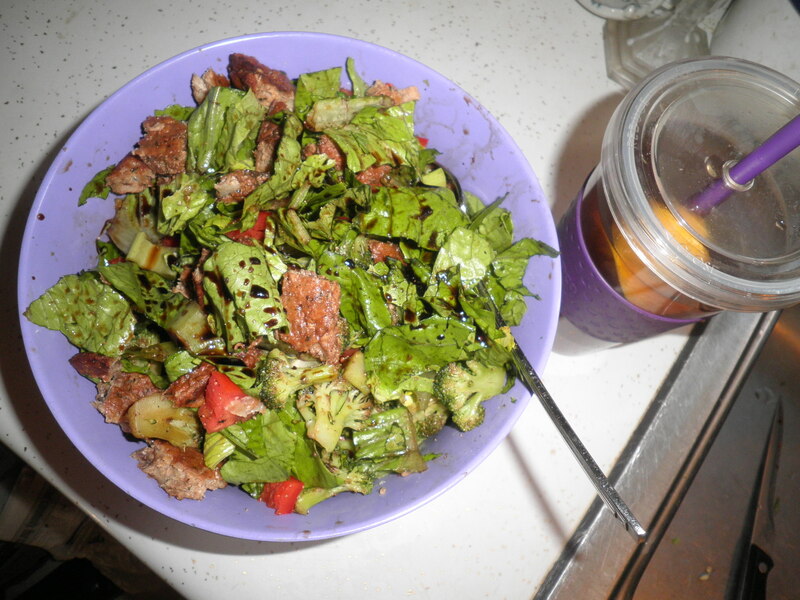 Nothing gets me back on track better than a salad in my Big Purple Bowl…this one with veggie burgers and balsamic vinegar. Homemade iced tea on the side. A trip to the diner? That sounds like home. 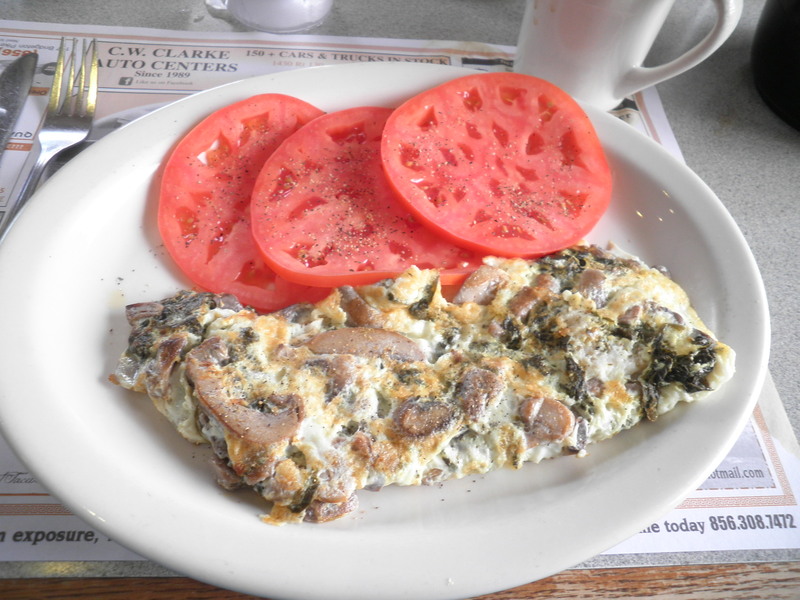 My favorite choice there is an egg white omelette with spinach and mushroom with sliced tomatoes on the side. This is the time of year to ask for the tomatoes. So good! 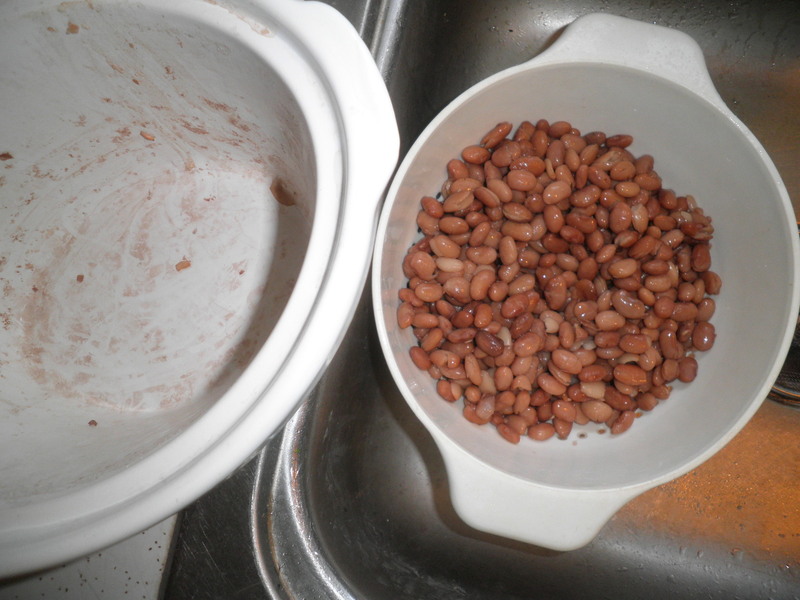 Pinto beans in the crock pot…one of my faves! So many things to do with them. However they always seem to end up in a salad in the BPB!! Happy me when I eat this! 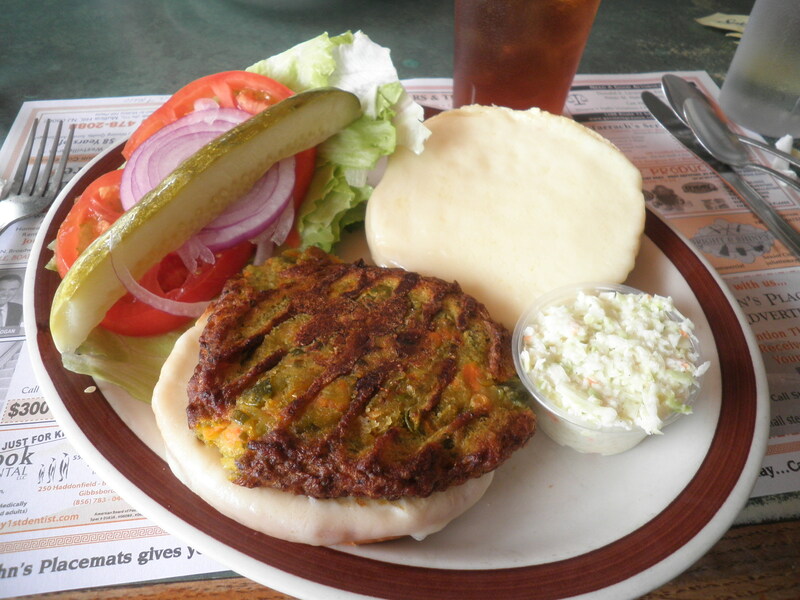 A veggie burger at the diner with provolone cheese. So good, since I hadn’t had one in a while. 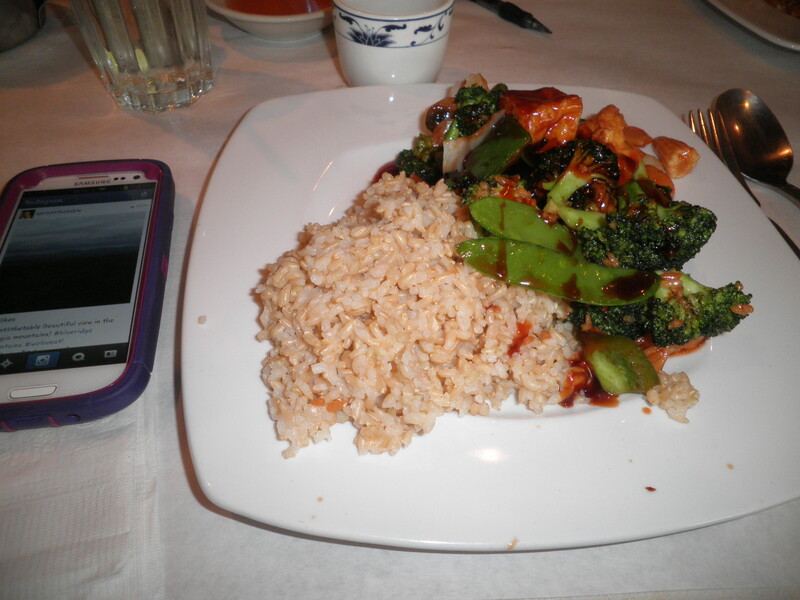 A visit to the China House? Ok, by me! Veggie delite is Mine! A little Instagram on the side. Yummy lunch at my sister Ele’s on Labor Day. 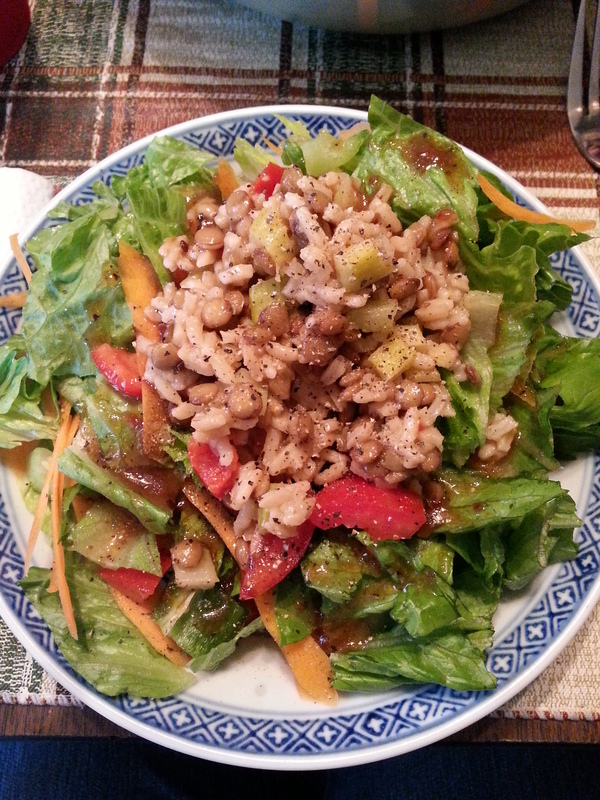 My salad plus her lentil rice salad. 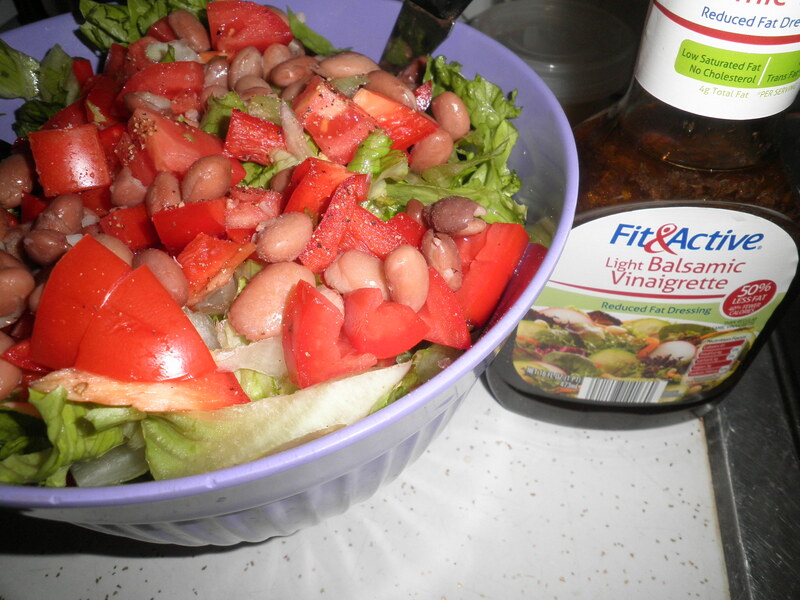 Plus a dressing I hadn’t tried before…sun dried tomato. So Good! So that’s What I Ate Wednesday for me this week. This is truly a crazed week with getting ready for our trip (See Monday’s Week In Review) so I’d better get on to all those lists! Be sure to visit Peas & Crayons to see what all the other fun bloggers are serving up and leave some comments. This entry was posted in Uncategorized and tagged Big Purple Bowl, crock pot, ice cream, WIAW. Bookmark the permalink. Yummm loving all those salads! And you’re right, this IS the time of year to ask for tomatoes! I love how juicy and ripe they are! Salads are the best and the bigger the better for me, Liz! They keep me full and on track. I’m not really satisfied without one. Have a great day! Thanks, Sarah. Love omelettes because you can make them your own by what’s added. Have a great day! 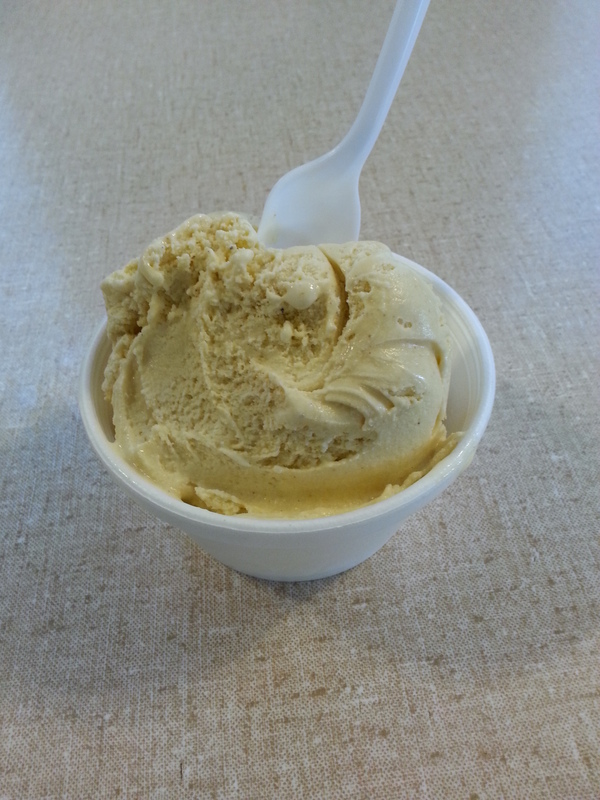 Pumpkin ice cream is something I can get behind – yum!! It is So good, Heather! I’m kind of glad that the ice cream shop will be closing soon…the temptation will be gone! Have a great day! Your food always give me cravings! I’m going to have to get a good veggie burger and some special ice cream next week – I’m going to San Fran and they have the BEST stuff! You are a woman on the Move these days, Laura!! San Francisco is so beautiful. Drove through there on the way to Sonoma county last year. Just seeing the mountains surrounding the bay way beautiful. Have Fun!! Always! Can’t stagnate. 😉 SF is one of my favorite cities! I see Aldi’s dressing. I love that store! Hi Dawn! I love Aldi’s, too! So much great stuff at such great prices. Glad there’s one so close. I’m going to miss it in New Mexico. Have a great day! What a bunch of delicious eats, and I’m glad to see someone else making some Crockpot beans. I’ve got onions going right now so I can freeze caramelized onions this weekend. Yum. The BPB is perfect for salads, and now I think I need a scoop of gelato. Have a great weekend Fran. Meghan, that sounds wonderful! Are you going to post the recipe? Or duh…is there even a recipe? Love my BPB, it is perfect and I’m always satisfied! It’s a Peas and Crayons recipe. I love veggie burgers and this one looks delicious! This veggie burger is so good. Had one at a different diner last night…close but no match for this one. Have a great Sunday, Ameena!